TF2Maps.net is getting a new look and new software! Discussion in 'Featured News' started by Fr0Z3nR, Aug 22, 2015. There has been some chatter that TF2Maps.net will be getting a new forum software, XenForo. This is true! Next week, August 29th, TF2Maps.net will be experiencing some downtime as Geit and some other staff work on migrating over data and resources to the new forums! This new forum software will improve many of the active features of the website. Which features, you ask? However, while we make this transition some things will be disabled or not existant. We'll let you know what the missing features are, as they become evident. That is, there are some things we might be able to get done, others we might not. We'll let you know as things pop up. Don't worry, we should be able to carry all your thanks over. I'll be working with Geit to write up a transition guide on how things will be different on the new system. You'll want to make sure to read it as things will be different. For example, if you create a map, instead of directly going to the map workshop, and making a thread for the map, you'll instead go to the resources tab, upload your map to that and it will automatically create a thread for you! If you ever need to update your map, just update the resource for it, and the thread will automatically make the necessary versioning changes for you. Again, I'll make sure to have a tutorial thing for everyone to use. We're really excited to do this, as many will agree, our current forums are starting to show its age, just like Hammer. If anyone has any questions, comments or concerns, please leave them here in this thread. You can also PM Geit if you don't want to chat publically. Edit: Actual site concern- are you working on getting certain extended Unicode images working, such as the crowns in my nametag? They don't show up under my name here, but tyler's umbrellas do. Out with the old thanks, in with the new thanks. So this means, for example, that the only way to have a thread for a map is if that map is uploaded here? Would have been a good idea back in the day, to stop people from posting their stuff offsite, but now that there's an official Map Workshop, don't we want people to transition to using that once their map hits beta? He means the workshop subforum. The point is map threads and downloads are now more unified and easy to understand as one object. You're still able to link to an external offsite file site, that won't change, but it'll be better for new maps to use the resource section and tie it to a thread. I'll look into it, not sure why it's nerfing them. You can create a resource with an offsite download. Good news. Looking forward to using the new forum. The term resources means things like models, textures and tools, all the assets that go towards making a map, to me. Maps are resources to server operators, but since this place is geared towards map authors, and the ultimate goal is to make maps and publish them, then perhaps they should be put in their own section, given the importance they deserve, rather than lumped in with assets. How long will this down time be? Hm. They show up on Chrome on this now-defunct, old, outdated site. I'll check other browsers and get back to ya. Awesome. That's how it looks on my iPhone on Safari. If you create a map, upload it to the resource section, you'll select the gamemode (maps), then it will create something in the map workshop. If you create a prop, or texture, you will select that category, and it will have its own thread created in the approriate forum. At least thats how I understand it to work. You can always create a thread on your own and use your own file hosting site. It sounds like it's functionally the same as downloads, but with an automated component to it. I'd like to do it in reverse for workflow reasons but if that isn't possible I understand why. So, it turns out that Xenforo only supports 3-byte UTF8 (because that's all old versions of MySQL support), which doesn't include many of the new emoji. There is this https://xenforo.com/community/threads/true-utf-8-support-mysql-utf8mb4.90122/, which I'll try *after* we've moved to the new system. No working emoticons, some of the user titles show up as "New Member," and no one has received any thanks. Is any of this part of the porting process? Edit: "New Member" and 0 likes received are also showing up in Chrome now. I don't believe anything but the most basic migration has started, so that will be normal. I think what is on the testbed is just a dump to make sure the forums and everything works. Woah, the time rift is fluctuating. Nametag is back, but the crowns are normal question marks. 0 thanks received is still a thing.
? 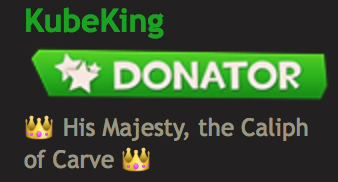 His Majesty, the Caliph of Carve ? Post numbers also aren't the same between sites, but I'm sure that's just an un-updated amount or something. I forgot to import thanks when I dumped the forums, it's on my to-do list for the actual port. Your user title changed to New Member because I was messing with it, it's fixed now, though I've decided utf8mb4 will probably be impossible - I'm not even sure how the current forums are coping with that, they really shouldn't. Emoticons also haven't been imported as they have to be "stitched" together into one huge image. I'll do that later on. EDIT: AAAHHH CLEVER GIRL - The current forums convert invalid UTF code points into html entities, which is a far nicer solution.